Yes! Yes! Me! I want to audition! Those were the words than rang in my head after watching an advertisement for a casting call for America’s Got Talent. For a brief moment I thought about what I might do on the show, but then realized that I don’t have that kind of talent. When I started to lament my lack of singing and dancing abilities, I stopped myself. Although I’m not particularly gifted in that way, I’ve also made choices that took me in another direction. Plus, I have other skills. The first time I was keenly aware that, in fact, I couldn’t be and do just anything was during my freshman year of college. While standing on the field where I played Junior Varsity field hockey, it suddenly struck me that I’d never be in the Olympics. It had never been a dream of mine nor did I have the athletic ability for this to have been a possibility, but in many ways this was a transformative moment. Although much of my future was yet to be determined, I realized that much had already been decided. We like to think that “the world is our oyster” and that with enough fortitude and determination anything is possible. Yet, that’s not actually true. The truth is that we’re constantly making decisions about our lives and as we do so, some doors close. But this also makes room for other doors to open. I will never be an astronaut, a famous actress, or a nomadic surfer looking for the next great wave. I have no desire to tumble around in space (I get motion sickness much too easily); I enjoyed acting when I was younger but was too dramatic to ever be very good; and I’m now at a point in my life where I crave stability (plus, I don’t really like having my head pommeled under water as seems to happen a lot in surfing). Although many doors have closed, others have opened in wondrous ways that I may never have even dreamed of. If you’d asked my college freshman self if I thought I’d be living in a small town in California and raising chickens (and loving it), I would have thought you were crazy. We don’t always know the path our life will take, and that’s part of what makes it so much fun. What are your talents and skills? In what ways has your life taken unexpected turns based on the choices you’ve made? When my family gives me a hard time for not being able to do DIY projects around the house, I remind myself that although I don’t have those particular skills, I have many others that are equally useful and creative. What can you do that no one else can? The next time you notice doors closing in your life, remember that they’re closing to make room for new adventures and opportunities. My greatest talent probably is my ability to eat. I love food and I love eating! As a result, I learned how to cook and how to grow my favorite fruits and vegetables, which in many ways has shaped my destiny. Food has opened many doors for me over the years. 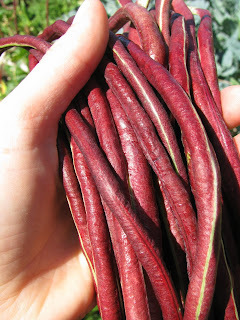 I love finding unusual heirlooms and vibrantly colored vegetables to grow. One of my best discoveries has been the Chinese Red Noodle long bean. On the vine it’s bright red but when cooked turns a lovely shade of purple. It’s similar in taste to a traditional green long bean. This is one of my favorite recipes, and I make it every other day when my vines are producing. 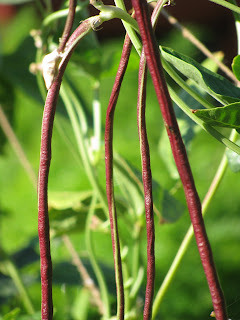 Long beans can be purchased in Asian grocery stores, farmers’ markets, and in most well stocked supermarkets. Although mine are red, most are green. They look like very long green beans. 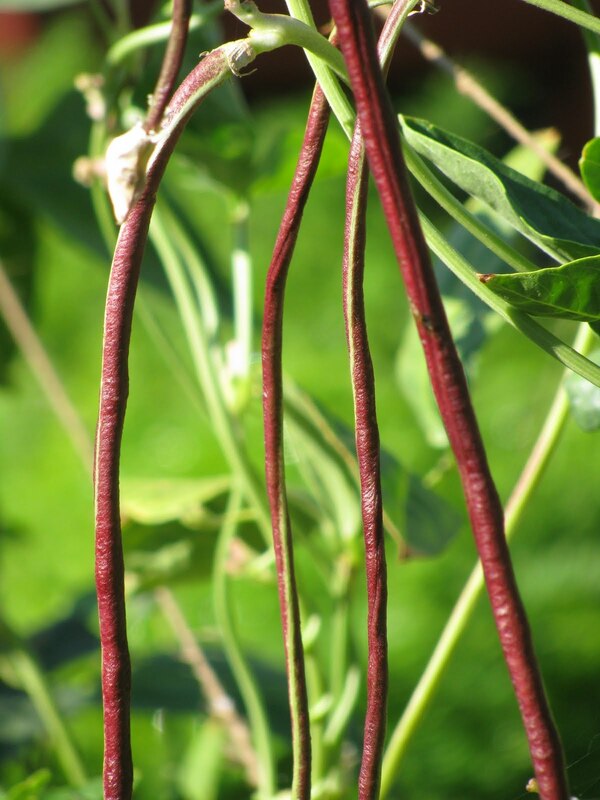 If you can’t find long beans, substitute string beans. To bulk up this dish, add ground pork, ground chicken, or crumbled organic firm tofu. *I use whatever I have on hand. Red, yellow, and white onions are all equally delicious. **I like a lot of garlic. The amount you use will depend on your personal taste and on the potency of your garlic. ***I use tamari because it’s gluten-free; however, soy sauce can be substituted. Soy sauce, however, is saltier and not quite as flavorful as tamari, so you may need to adjust the quantities. Wash and cut the beans. Slice the onions and garlic. Heat the oil in a wok or large frying pan (I use a cast iron skillet) over medium-high heat. When the oil is hot (don’t let it smoke), add the long beans, onion, and garlic. Stir frequently to keep the garlic from burning. Adjust the temperature as necessary. When the vegetables are tender but not quite fully cooked (about 5 minutes), add the tamari, brown sugar, sesame oil, and chili flakes (if using). Continue to stirfry until the beans are fully cooked and the onions are soft, about 5 more minutes. Serve with rice. Love this! I too will never be an astronaut or a surfer. ANd, celebrating what I CAN do is far more joyful than lamenting what I cannot. Thanks for this brilliant reminder Meadow! You are great! So very true! Thank you for your wonderful reminder!